This view improves on the mock-up shown in the original blog post, adding color-coded highlighting of version-to-version differences. I think it’s a striking illustration of how a thought evolves through a sequence of written snapshots. It reminds me of Michael Rubinstein’s astonishing TED talk on a video processing technique that reveals and amplifies normally undetectable color change and motion. If Kate had been using a conventional writing tool, it would be much harder to observe what we see here. But in FedWiki a paragraph is special. It has its own version history. Every time you open up a paragraph to change it, that change is recorded. 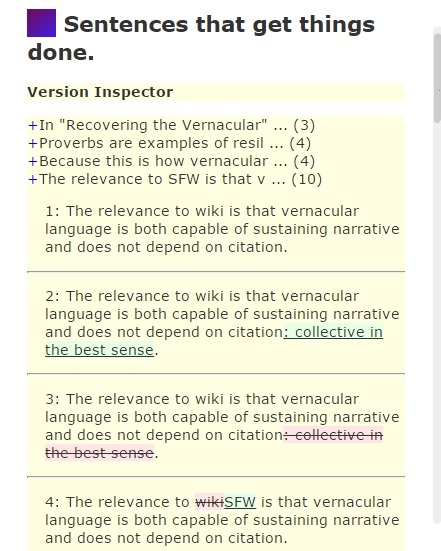 To the extent there’s a correspondence between paragraphs and thoughts — and in prose that is often the case — FedWiki intrinsically enables the study of those thoughts in motion. When computers make visible what was formerly invisible there is always an initial rush of excitement. Then the question becomes: Is this useful? And if so, in what ways? I can envision two primary uses of this technique. First, for writers. We all compose differently, and not everyone will want to be able to replay the changes to an individual paragraph. But if you do want to, conventional tools aren’t much help. In Google Docs, for example, you can roll through versions of a whole document but it’s not easy to focus on how a single paragraph changes. A second use, as suggested in the original post, is for teachers of writing and their students. In other domains, such as music, computers have become powerful tools for studying finished compositions. Adrian Holovaty’s Soundslice, for example, makes YouTube performances accessible to study and annotation. In that case there’s nothing hidden, the tool’s job is to slow things down and provide a synchronized framework for annotation. But what if you wanted to study the process of musical composition? Then you’d want the composition to occur in an environment that records changes in chunks of varying granularity that correspond to the structure of the piece. Because FedWiki naturally divides writing into paragraph chunks, it enables us to see how paragraph-sized thoughts evolve. But a FedWiki page is not only a sequence of paragraphs. Other kinds of objects can be injected into the page by plugin that manage, for example, data sets and small scripts written in domain-specific languages. These things have their own version histories too. Most knowledge workers, with the notable exception of software developers, don’t yet use tools that take version control for granted. That will change. The artifacts produced by knowledge work are simply too valuable to be managed any other way. As versioning tools evolve for other disciplines, we have the opportunity to rethink what those tools can do. I hope we’ll do that with sensitivity to the natural granularity of the material. In many cases, whole documents aren’t the right chunks. Even in software development, of course, we are still working with document-sized chunks. Compilers know that programs are made of modules and functions, but editing tools don’t track changes that way and as a result GitHub can’t directly show us the history of an individual function. That would be useful for the same reasons I’ve mentioned. It would help programmers reflect on their own work, and enable teachers to show students more about how code is written and how it evolves. Tools for structured writing aren’t a new idea, of course. There are reasons why they haven’t caught on. But FedWiki reminds us that there are also reasons to hope they will. Jon, The following paragraph is special. I love your writing, btw. If this was in the #fedwiki, I’d fork it. So I’m going to comment here now, so I remember to do something with this later. Right now, if somebody needs something from me more complex than an emoji, then they will have to wait until tomorrow. Jon, these questions you are asking about the practice and purpose of writing have sat me down to think about how much we have lost in formal education where we treat writing only as the visible evidence of what has been learned. Writing becomes a particularly leaden kind of demonstration, a proof of the event of having been taught. This writing comes with instruction, and so many rules. Start here, write your introduction like this, link paragraphs in this way, end here. I think people find it genuinely difficult to care about writing that they make to this template. There is no grain in it, just reproducible competence. What if there is more to writing itself than as the servant or function of thought? And what about our capacity to value ideas that are difficult to express, but that we can share without analysis or explanatory talk? I’ve stayed connected to Federated Wiki because I’m trying to feel my way through the experience of becoming better at using it while observing what using it does to me. Wikipedia quotes the idea of a happening as having a “brief, detached quality” and for me fedwiki has re-awakened this quality in the practice of composition among pieces–paragraphs, pages, ideas. I find myself arranging pieces rather than explaining much. So it’s truly useful to see and be able to think about the linearity in compositional time that’s now uncoupled from the linearity of the outcome. I would like to develop and teach a writing practice focused on this. Still thinking, still finding your writing about all this very helpful. Thank you. If you want to learn how to play an instrument, or learn how to fix a toilet, there are lots of examples floating around on YouTube of videos that teach by transmission of tacit knowledge. The musician or the plumber may be telling you how they /think/ they are doing what they do, but when you can observe them performing it you absorb much that they only know tacitly and convey unconsciously. The feeling of the rhythm. The amount of force required to turn the wrench. Writing is normally a much less observable kind of performance. And I’m going to guess that you were surprised by some of the choices you made (and reversed) in the crafting of the paragraphs in the essay I highlighted. When we can watch your mind at work, doing things that you might be able to explain in retrospect but perhaps wouldn’t think to notice and describe, we absorb tacit knowledge in addition to what you explicitly know and teach. That’s why this way of opening a window into your tacit mind is, for me, such a revelation. Yes, you’re right that I was surprised. It was a bit like being taken back through a dream. In a sense the interior journal of tacit knowledge is what’s suddenly on display here; leafing back through it is like rewinding time. I think that’s why it feels so strange.